I've spent years pouring over time management books. I've discovered a lot of helpful tips, but there's one, single lesson that stands out above all others. Throughout years of trying to improve my productivity, there's one, single time management lesson that has had an enormous, positive impact. No amount of getting up earlier, time blocking, or clearing your email inbox will help until you learn this one crucial lesson. 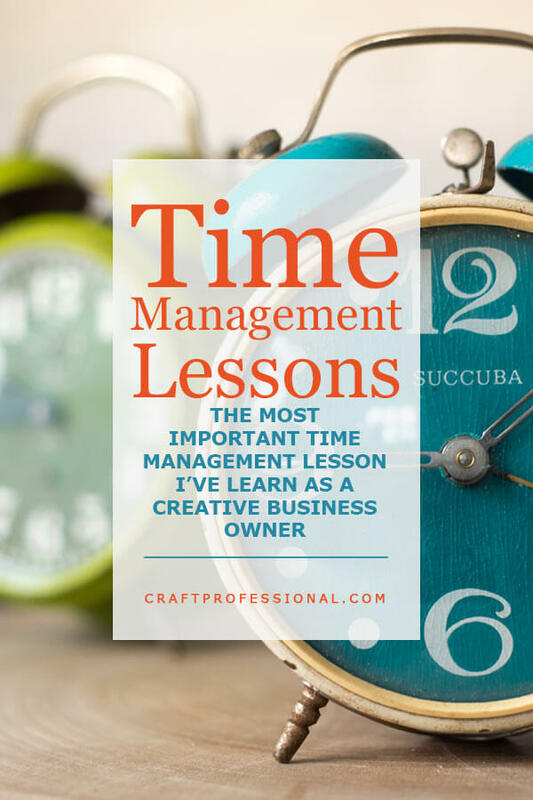 What's the most important time management lesson I've learned over the years? 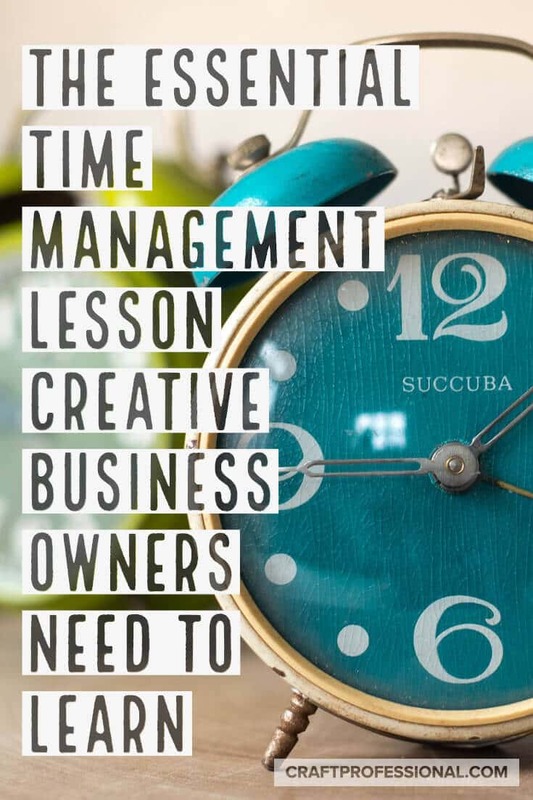 Learning how to manage my time while working from home has probably been the most profound challenge I've dealt with over the years that I've been self employed. I have no shortage of motivation. And, although I'm not perfect, I'm not a huge procrastinator. But time management is still tricky. Time management is deeper and more complex than you might initially think. It goes well beyond strategies like managing your email better, or immediately doing any task that can be completed in less than two minutes. Although those kinds of strategies can be helpful, truly effective time management speaks to your values. When done with care, saying yes to certain projects and no to others becomes an expression of your values and priorities. That, for me, is a balance I feel I'm constantly working to maintain. Realizing that I can't do it all, but I can do a small number of things really well has been the toughest time management lesson I've had to learn over and over. It's about learning to evaluate opportunities, so you can choose the ones that are the best fit with your values and skills, and being willing to let go of the rest. This time management lesson has been the most crucial for me. Realizing the value and irreplaceable nature of your time underpins everything else and makes it much easier to say no when you need to. Strangely, I've found that time can become devalued when you're self employed. As an employee, you think about exchanging your time for an hourly wage, or a yearly salary, but when you become self employed, time is the first thing you begin to give away for free. 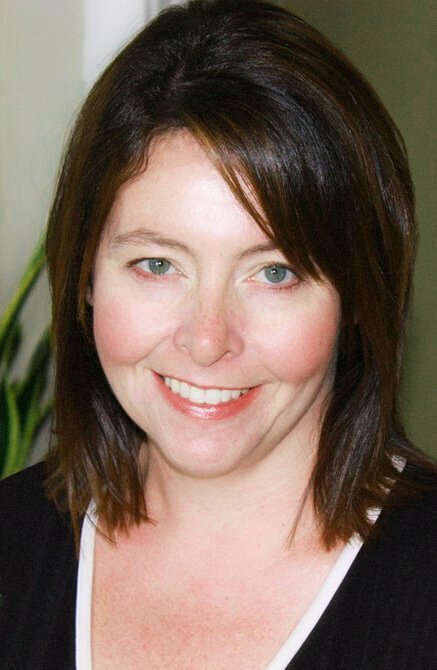 Certainly, that can be a necessary phase of business building, but it can also become a slippery slope. When you're working to establish your business, and money is tight, it's easy to get into the mindset that as long as something doesn't cost money, and only costs time, it's okay. I used to measure certain business decisions based on money alone. Much to my frustration, I've watched others do it, too. If I was comparing two tools for managing social media accounts, one paid and one free, I'd go with the free option automatically because, I reasoned, why would I spend money if there is a free tool. As I began to value my time more, I started evaluating tools based on value for money, and how much time they could give back. Sometimes the free option is still a good solution, but sometimes it's worth spending a little money to get back a lot of time. If you've quit your day job, people see that you suddenly have what looks like a clear schedule, and they think they can call on you for all kinds of favors. When I realized the value of my time, it became much easier to turn down people who wanted to encroach on that time because I could see the lack of respect underlying their requests. To the mom who is not even my friend, but aggressively demanded I should regularly babysit her kid for free while she was at work, I say, "Hah! No way, babe. Go find someone else to use." Okay, I did say it a little more diplomatically, but I have a business to run, and I'm not giving away my time to someone who clearly has no regard for me. The next time you catch yourself thinking something is okay because you are "only" spending your time and not your money, stop for a minute. My time is my most precious commodity. Ask yourself whether what you're doing is the best use of that time. Similarly, the next time someone tries to push you into doing something that is a complete no-win for you, remember they are showing a total lack of regard for your time. Keep that in mind as you formulate your response. Know when and how to say "no" in business and in your personal life. Saying no becomes easier when you realize the value of your time, but it can still be tough, particularly with people who are aggressive, or with people who've come to expect you to say yes. Saying no can definitely be uncomfortable at first, but if you practice it a few times, you'll realize you can turn down requests, and the world won't fall apart. If you say no when you mean it, you'll probably actually feel like you're doing a better job of holding your own world together. Although there has been the odd awkward conversation in which I've had to stand my ground, the vast majority of people have accepted my "nos" graciously. I've discovered I may have to say no to people two or three times, but once that's done, the boundaries become clear, and people stop making certain requests on my time. When I'm having trouble saying no to something, I imagine what would happen if I said yes when I don't want to. I know myself well enough to realize that when I mean no but say yes I end up resenting the whole thing. That resentment typically results in me being sloppy with the task at hand, and, in turn, those counting on me end up annoyed and disappointed. Playing out the scenario in my mind makes it much easier to just say no in the first place. A little honest conversation can save a whole lot of resentment later on. Beyond the need to say no to people and projects that aren't a good fit for my values and priorities, the second biggest place I've have to set boundaries is with technology. I'm old enough to remember a time when people didn't expect immediate responses to every little comment or question. I remember when it was considered a good time management strategy to let someone sit with a question for a few hours before you dove in to respond because often, if you just gave them a little time, they'd solve the problem for themselves. Expectations have changed a lot, but I still believe there's much to be gained from disconnecting from time to time. I have purposely set up accounts and apps on my phone to limit distractions and keep interruptions to a bare minimum. I have an email address for messages that come from customers or readers, and all other emails come on a separate email address. I let my phone send me push notifications when email comes in on the customer/reader address, because that might be time sensitive, but I don't get push notifications for any other email. I check all other email once a day. That's it. I have none of the email angst that some people struggle with. If you can set up your email so you know you'll be notified about the important stuff, and let the rest wait, you'll be less tempted by constant email checking. You can be confident in checking your email less often because you know you're getting notifications for the most important messages, and everything else can wait. Some people put their phones on do not disturb mode when they sleep. I take do not disturb a step further. I set my phone to go into do not disturb mode two hours before bed, and it stays on until after breakfast when everyone else is out the door, and I'm ready to start work. Avoiding constant notifications two hours before bed gives me time to wind down, so I can get a good night's sleep. Keeping notifications off for an hour in the morning lets me start the day right, focused on my family. It's a small change, but it has had an immense impact. There are certainly times when an immediate response is warranted and will head off problems. However, they are probably less frequent than you might think. If you train people to expect an immediate response from you, that's what you'll be stuck with. If you say no to most immediate responses, except for the truly time-sensitive, you'll have far more time to focus and work uninterrupted. Be yourself. Don't try to be someone else's version of great. You can't do and be it all, so you might as well be a great version of yourself. The same is true for your business. You can't chase every business opportunity that exists, but if you have a firm grasp on what your business is, and what it is not, it will be much easier to decide what to pursue and what to leave for someone else. Decide what makes you and your business special. Be that, and don't chase someone else's dream. Sometimes, when I look at other business owners, I catch myself admiring something they are doing that I am not doing. Then, I think I'd better get on that (whatever it is) for my own business. That feeling doesn't come out of any real research that indicates a certain project would be a good business move for me. It's just a gut feeling that comes from a fear of missing out or comparing myself to someone else. It's easier to separate from and let go of those feelings if you know what your business is and what it is not. What's right for one business is not right for all businesses. Laser-focus on the things you do spectacularly well in your business and on the things that make your business what you want it to be. Let someone else, in their business, do the other stuff that's not true to you, your strengths, and your values. Learning to say yes to the right projects, and saying no to everything else is at the root of really good time management. It's important to avoid committing to every so-called opportunity that comes along. They aren't all good uses of your time. As much as possible, get others on board and communicate clearly, so people understand where your boundaries are. Ultimately, when you choose to say yes or no to the ways you use your time, those answers should be a clear reflection of your priorities and values. It's one thing to know how to say no and it's quite a different skill to know when to say no. Even if you're able to say no to things you know you don't want to, or shouldn't do, it can be a challenge to recognize the things you'd like to do, but need to put aside because they don't fit with your other, more important goals and values. That's why I love Tony Crabbe's book, Busy. It's all about helping you recognize when enough is enough, see that you can't do it all, and realize what to let go of in your life, so you can put your best efforts in a few, important places. If you want to set better boundaries in your life and your business, I think you'll find the advice in this book is an excellent place to start.